Posted November 29th, 2017 by Kelsi Hines & filed under Uncategorized. 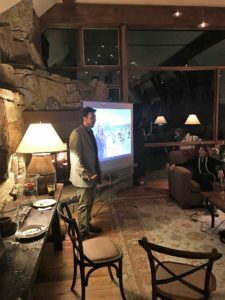 Co-Founder, Chas Salmen sharing OHR’s vision of a sustainable future for Mfangano Island. Last week, two long-time supporters of Organic Health Response, Bruce and Jan Shugart, graciously opened their home in Glenwood Springs, CO to help us kick off the 2018 “Mfangano Tomorrow” Capital Campaign! 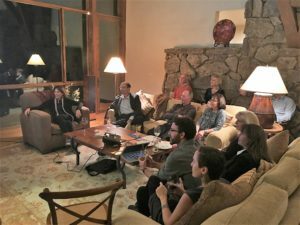 Over the course of the evening, 25 friends and guests came together to learn more about the remote communities of Mfangano Island, Kenya and pitched in to support the vital growth of this community for generations to come. Together, this dedicated group raised over $10,850! Big thanks to Bruce and Jan for organizing the event, opening their home and helping OHR to grow our network! We are also grateful for the food provided, the beautiful kitenge bags made by Mfangano craftswoman Elida, and all of the new and old friends who shared the evening with us. This is the first of many gatherings to support “Mfangano Tomorrow.” Stay tuned to help us secure a sustainable future for Mfangano Island, Kenya.